Take a small sample of living tissue, which can make thousands of mini-brains from one rodent brain. Isolate and concentrate the desired cells with some centrifuge steps. Use that refined sample to seed the cell culture in medium in an agarose spherical mold. The spheres of brain tissue in the study begin to form within a day after the cultures are seeded and have formed complex 3-D neural networks within two to three weeks. Study senior author Diane Hoffman-Kim, associate professor of molecular pharmacology, physiology and biotechnology (also associate professor of engineering at Brown and affiliated with the Brown Institute for Brain Science and the Center for Biomedical Engineering) hopes the mini-brains might proliferate to many different labs, including those of researchers who have questions about neural tissue, but not necessarily the degree of neuroscience and cell culture equipment required of other methods. There is a high demand for in vitro models of the central nervous system to study neurological disorders, injuries, toxicity, and drug-efficacy. Three-dimensional (3D) in vitro models can bridge the gap between traditional 2D culture and animal models because they present an in vivo-like microenvironment in a tailorable experimental platform. Within the expanding variety of sophisticated 3D cultures, scaffold-free, self-assembled spheroid culture avoids the introduction of foreign materials and preserves the native cell populations and extracellular matrix types. 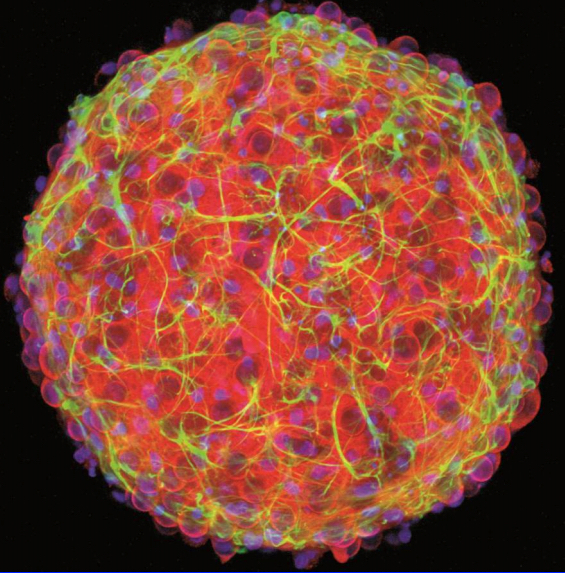 In this study, we generated 3D spheroids with primary postnatal rat cortical cells using an accessible, size-controlled, reproducible, and cost-effective method. Neurons and glia formed laminin-containing 3D networks within the spheroids. The neurons were electrically active and formed circuitry via both excitatory and inhibitory synapses. The mechanical properties of the spheroids were in the range of brain tissue. These in vivo-like features of 3D cortical spheroids provide the potential for relevant and translatable investigations of the central nervous system in vitro. Mrs. Yu-Ting L. Dingle, Miss Molly Elizabeth Boutin, Dr. Anda M. Chirila, Dr. Liane L. Livi, Mr. Nicholas R. Labriola, Dr. Lorin M. Jakubek, Dr. Jeffrey R. Morgan, Prof. Eric M. Darling, Dr. Julie A. Kauer, and Dr. Diane Hoffman-Kim. Tissue Engineering Part C: Methods. -Not available-, ahead of print. DOI: 10.1089/ten.TEC.2015.0135.